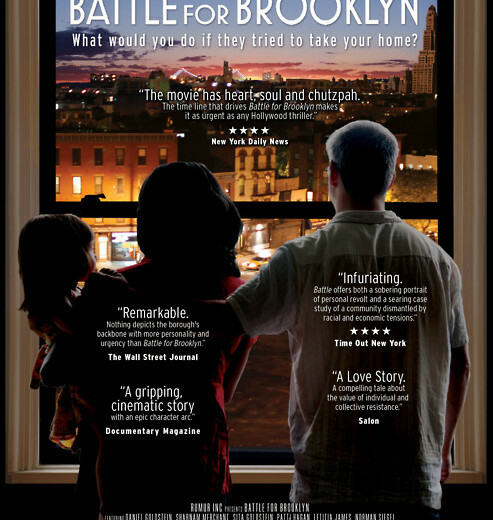 BATTLE FOR BROOKLYN follows the story of reluctant activist Daniel Goldstein as he struggles to save his home and community from being demolished to make way for a professional basketball arena and the densest real estate development in U.S. history. Along the way, he falls in love, gets married and starts a family while living in a vacated building located at the heart of the project site. Over the course of seven years, Daniel spearheads the movement against the development plan as he and the community fight tenaciously in the courts, the streets, and the media to stop the abuse of eminent domain and reveal the corruption at the heart of the plan.